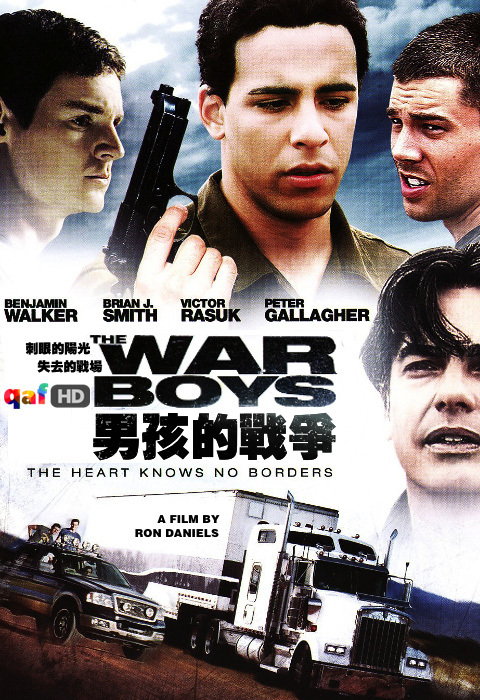 The War Boys (2009). Three young and bored childhood friends spend their spare time during college's spring break around the border that separates the U.S. from Mexico; living on the U.S. side of the border, they help the police patrol chase back clandestine Mexican immigrants. Angry at his father because he won't agree to him leaving school to join the family business, David sets up a plan to steal one of his dad's trucks that should be loaded with black market TV's from Mexico and make some money by selling the goods. The father vows to avenge the theft. The three-party theft is a success and the locked truck is temporarily abandoned in a desolate area while the boys look for a purchaser. The operation goes perfectly fine until a group of traffickers threatens the love interest of one of the lads, a Mexican woman who had occasionally helped immigrants to get fake documents, and interrogates her on the whereabouts of the cargo. The boys are still unsuspecting, but this episode makes it clear to them that the truck must contain something more trouble-worthy than just TV's, possibly drugs. Determined to get some profit anyway, they choose to get back to the wasteland, take what they can and then have the truck recovered by the traffickers via an anonymous call. It all falls out of control when they unlock the truck's storage, only to find out that it hid something far more precious than any kind of merchandise, and a mix of rage and fear leads the situation to slip completely out of their hands as the three friends confront the protagonist's father and the police. One of the guys ends up being shot and tragedy starts.